From Wisconsin to Washington, DC, the claims are made: unions are responsible for budget deficits, and their members are overpaid and enjoy cushy benefits. The only way to save the American economy, pundits claim, is to weaken the labor movement, strip workers of collective bargaining rights, and champion private industry. In "They're Bankrupting Us! 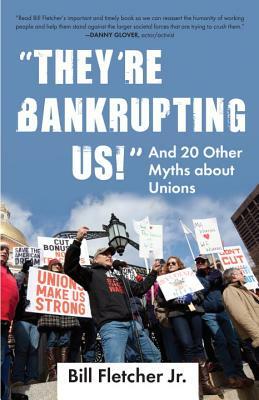 ": And 20 Other Myths about Unions, labor leader Bill Fletcher Jr. makes sense of this debate as he unpacks the twenty-one myths most often cited by anti-union propagandists. Drawing on his experiences as a longtime labor activist and organizer, Fletcher traces the historical roots of these myths and provides an honest assessment of the missteps of the labor movement. He reveals many of labor's significant contributions, such as establishing the forty-hour work week and minimum wage, guaranteeing safe workplaces, and fighting for equity within the workforce. This timely, accessible, "warts and all" book argues, ultimately, that unions are necessary for democracy and ensure economic and social justice for all people. Bill Fletcher Jr. is a long-time racial-justice, labor, and international activist, scholar, and author. He has been involved in the labor movement for decades, and is a widely known speaker and writer in print and on radio, television, and the Web. He has served in leadership positions with many prominent union and labor organizations, including the AFL-CIO and the Service Employees International Union. Fletcher is currently the director of field services for the American Federation of Government Employees.